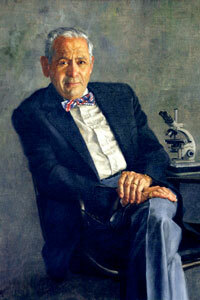 In recognition of his pioneering role at NIEHS, Kotin's portrait hangs on the walls of the Institute's Rall Building Lobby outside Rodbell Auditorium beside portraits of his successor, David Rall, M.D., Ph.D., and Director Emeritus Ken Olden, Ph.D.
Pauline Kotin, wife of pioneer environmental health physician-scientist and NIEHS Director from 1966-1971 Paul Kotin, M.D., has notified friends at NIEHS of his death May 12, 2008 in Laguna Beach, Calif. In addition to his wife, he is survived by two sons, four grandchildren and two great-grandchildren. A pathologist by training, Kotin was director of the Division of Cancer Etiology at the National Cancer Institute (NCI) when he was named head of what was then called the NIH Division of Environmental Health Sciences, which was officially established in November 1966. With NCI colleague William Payne, Kotin had started planning for the National Environmental Health Sciences Center a year earlier to help address what he argued was an urgent need for toxicity studies "following long-term exposure to low levels of noxious environmental agents... to establish a scientific basis for protection of the public." 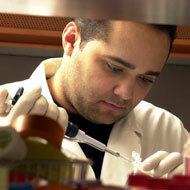 It was under Kotin's direction that NIEHS achieved institute status in 1969 as the ninth institute in the NIH with Kotin as the first director and a budget of $17.8 million. His vision of the new organization was a foundation for the use of innovative, multidisciplinary methodologies and vigorous extramural research programs relying on close relationships with the NIH and major universities, especially those in the Triangle. Kotin's early appointments, such as Scientific Director Hans Falk, M.D., helped set the tone for scientific excellence that would come to characterize the Institute and continued to provide leadership during the 1970s under his successor. His original vision for the Institute was the most comprehensive strategic plan until then Director Ken Olden, Ph.D., oversaw the Vision for the Future published in 1994. His hope that NIEHS could preserve the rural aspect of the area where the new campus would be built proved to be influential in its design and present character. 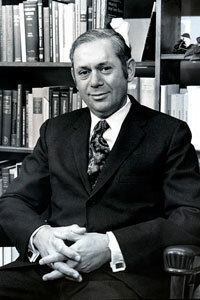 Kotin considered himself an academic at heart, and in 1971 he accepted an appointment as dean of the School of Medicine, vice president for Health Sciences and provost at Temple University in Philadelphia. In 1974, he joined the Johns-Manville Corporation in Denver as senior vice president for Health, Safety and Environment. Kotin was widely regarded as an international expert on environmentally caused lung diseases, especially those caused by toxic substances such as asbestos and beryllium, and served on many committees and advisory boards as member or chair. He received a number of awards for his contributions to public health, including the US Department of Health, Education and Welfare Superior Service Award and Distinguished Service Award and the Knudsen Award from the American Occupational Medicine Association. Kotin was known for the scientific integrity he displayed throughout his varied career in medical practice, research, administration, education and industrial medicine. Kotin's long medical career included service in the Army Medical Corps during World War II, following his graduation from the University of Illinois, where he received his M.D. in 1939. After completing a pathology residency at the Deaconess Hospital in Chicago, he served in the US Army Medical Corps from 1941 to 1946 in the Pacific Theater and in California. After the war, he was in private practice for two years before going to work at Los Angeles County Hospital and the University of Southern California, where he was the Paul Pierce Professor of Pathology before joining the National Cancer Institute in 1962. Even after his retirement in 1981, Kotin continued to be active in business consulting and public service capacities. From 1988 - 1990, he served on a National Academy of Sciences committee that provided oversight of the Department of Energy's management of the U.S. nuclear stockpile. "Summers of Discovery Student..." - previous story next story - "Spring GEMS Meeting..."
111 T.W. Alexander Drive, Research Triangle Park, NC USA 27709. Last reviewed: 30 May 2008.